I have been smoking all sorts of meats for years. But for some reason, chicken thighs never made it onto my list of things to smoke. I was jonesin’ for a BBQ chicken sandwich. Now normally, I’d smoke a boneless chicken breast that I had brined (to keep it moist and tender) and shred or chop it. But since I’ve been on a chicken thigh kick lately, and had a freezer full of thighs from the last time they went on sale, I decided on smoked chicken thighs. And boy I could not have been happier. After just a few hours these smoked chicken thighs were done. Super juicy and tender, I knew I was in for a treat. It didn’t take long to remove the skin and separate the meat from the bones. Smoked thigh meat is perfect on BBQ sandwiches or nachos or pizzas. Trim any excess fat from the thighs. Place them in a large (large enough to hold the chicken and brine) resealable container. Add the brine. Stir gently to make sure the chicken is all exposed to the brine. Seal and refrigerate for 3 hours. Remove the chicken from the brine (discard) and rinse with cold water. Return the chicken to the (now dry) container. Squirt the thighs with the mustard, turning to get all sides. Rub the mustard around and cover the thicken. Sprinkle the chicken with the rub, making you sure you get it on all sides. Fire up your smoker for cooking at 230 F. Use a nice fruit wood such as hickory. For a stronger smoke flavor use hickory. Add the chicken to the smoker and smoke until the internal temperature reaches 170 F, 2 to 2 1/12 hours. Remove the chicken. Discard the skin. Pull the meat from the bones and chop or shred as desired. Combine all ingredients. Stir until the salt and sugar are dissolved. 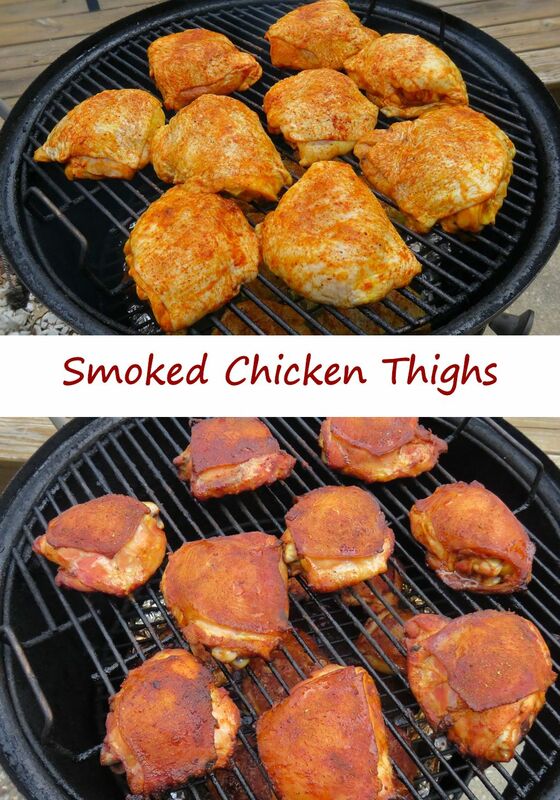 This entry was posted in From the Grill & Smoker and tagged chicken thighs, recipe, smoked chicken, Smoked Chicken Thighs by Mike. Bookmark the permalink.